yuletide fluffing will be a guaranteed success. 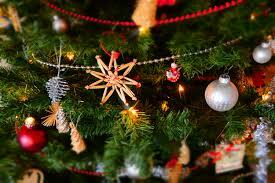 • Before the tinsel comes out do a quick spring clean, and remove some of your usual decorating items to avoid clutter. Consider moving furniture around to allow for a greater flow of bodies to minimise congestion with a house full of people. • Pick a colour theme to make the look dynamic and stylish. I love silver, white and black for effortless chic; and silver, grey and lavender for a more feminine feel or even dynamic red and green with touches of nature for a timeless classic. • Think nature to give you a rustic but elegant look. Big natural branches look amazing strung with lights or simple glass baubles. I love branches as centrepieces on the Christmas dining table to create a relaxed and casual feel. Use costume jewellery strewn throughout candles to add a really elegant feel to the table. • Candles, especially led candles, will give your home a warm glow without mess or fuss or danger. I have a huge array of candles on my main dining table that create a beautiful sight when you come home after a late night. • The same principle applies to Christmas decorating as it does to everyday life: less is definitely more. Large statement pieces will give the home a WOW factor especially in key focal areas. • Remember first impressions count, so an amazing hanging on your front door or a great Christmas inspired arrangement in your entryway will instantly create a mood. also lighten the financial drain, but don’t place yourself under extra pressure if this activity is not a joy for you.